When planning population health promotion activities to address smoking it is important to be able to clearly identify the problem. Once you have described the problem, you will need to develop a strategy to address the issue based on local needs. There is good evidence that programs work better when different activities are part of a multi-component approach to tackling smoking. This is how the overall TIS program has been designed, combining individual approaches such as Quitline, with the TIS teams’ population health promotion activities. TIS teams are not funded to deliver individual smoking cessation, but they are expected to link into local cessation services. 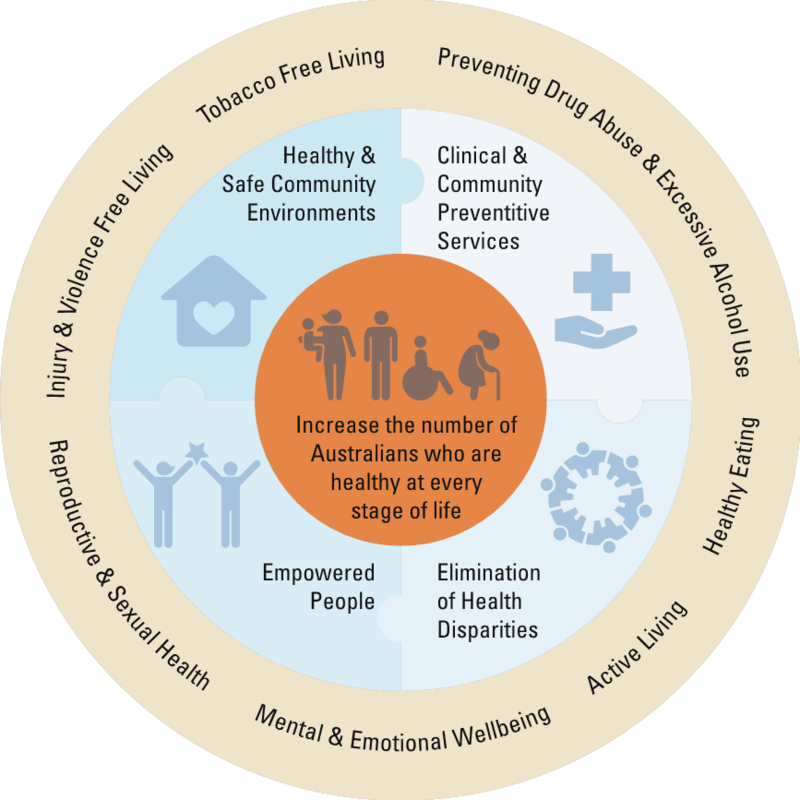 This page outlines ways of planning your activities to include population health promotion approaches. It also describes how you might link into existing smoking cessation programs. It includes strategies to map community strengths, develop partnerships, and build workforce capacity. This page also describes how the TIS program can be seen as part of a larger preventive health care system. For more resources to support planning see also Planning tools in the Resources section. What is the size of the smoking problem in our region? Are there any particular groups with specific needs? Are there any groups who are going to be harder to engage? the findings of projects like the national Talking About the Smokes initiative. State and Territory health data. Once you have clearly described the problem to be addressed in your region, you will need to develop a strategy that will allow you to tackle the issue locally. Tackling Indigenous Smoking (TIS) funded activities are expected to use a range of evidence-based activities (multi-component) and take a systems focused approach (looking at all aspects of the problem and all of the support services available for the local population) to tackle smoking. You should also think about any TIS activities you have already carried out locally and what difference they have made to community awareness of smoking matters. What is the multi-component approach to TIS? There is good evidence that programs to reduce smoking work better when they focus on community (population) as well as individual change. increasing access to use of nicotine replacement therapy (NRT) and prescription medicines (pharmacological interventions) to support smoking cessation through education and partnerships with cessation services. It is important that the activities chosen during the planning stage are evidence based, like those described under Activities. However, projects will be most effective when teams are able to develop successful partnerships with other health teams and programs (e.g. ‘drugs and alcohol’, ‘mums and bubs’), as well as with community organisations (e.g. social services, schools). This creates a network of care, which connects participants wanting to quit to a service or organisation where they can then access individual cessation support. Box 2 gives more tips on networking. All organisations have networks. Often you can get the support of another organization to give you access to their network. This isn’t exactly a partnership – it’s more of a helping hand to put you in touch with a group of people you would not normally be able to access, but who are on your side. Having access to other networks can really help put together a project to potential participants. The important thing is to respect confidentiality and privacy in gaining access to other people’s networks. If you don’t have a network you can tap into, think about running a workshop as the basis for establishing a network with other local health workers, who might be interested in health promotion and tobacco control. Source: material adapted from Kruger K, McMillan N, Russ P and Smallwood H (2007) Talkin’ up good air: Australian Indigenous tobacco control resource kit. Melbourne: Centre for Excellence in Indigenous Tobacco Control . Effective governance (management and administration) – including the full support of senior management of the host organisation. Consultation with the local community – working with the community to tackle smoking is about respecting others and strengthening Aboriginal and Torres Strait Islander knowledge. Finding time to talk to local communities and stakeholders is important because it ensures that the community is engaged and has ownership of the project. It is also about acknowledging and strengthening the role of Aboriginal and Torres Strait Islander community organisations in health promotion activities. Box 3 has quick tips on how to make sure the community is involved in your project. Workforce development and management – including appropriate training and keeping skills up-to-date, clarity of roles, effective line-management and mentoring. You can find out more about training for TIS workers under Events and Training. Monitoring – outcomes and strategies for the project are agreed to through conversations between workers, other services and the community about what worked, what did not work and what should be done next. Monitoring for TIS is covered in more detail in the Monitoring and evaluation pages. talk and walk through how information will be shared, owned and fed back to the community, and how decisions will be made. make sure that the information or research gathered on the project or program will benefit the community. make sure there are representatives from community organisations. Source: material adapted from Kruger K, McMillan N, Russ P and Smallwood H (2007);Talkin’ up good air: Australian Indigenous tobacco control resource kit. Melbourne: Centre for Excellence in Indigenous Tobacco Control . Different models and approaches can be used to develop health promotion projects. 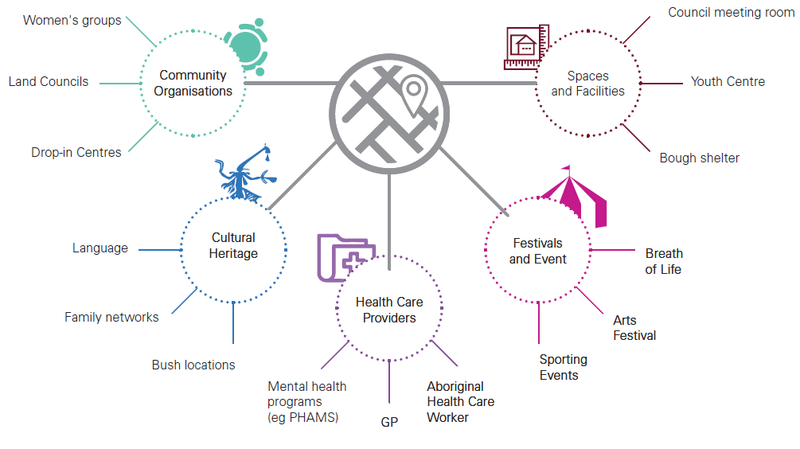 Below we describe one approach that has worked well for organisations developing TIS projects in Aboriginal and Torres Strait Islander communities. However you might want to consider other public health models such as PRECEDE-PROCEED that also emphasizes community involvement in a project (see Box 4). This model believes health promotion should be community-based, and that planning and implementing a project needs everyone in the community – from policy makers to community members – to work together from the start of the project. Phase 6: Process evaluation. Are you doing the activities you planned to do? Phase 7: Impact evaluation. Is the project having an impact on your target population? Phase 8: Outcome evaluation. Is the project leading to the desired outcome? You can find out more about this and other models for developing health promotion projects on the Community tool box website. Taking a systems approach to developing a TIS regional tobacco control program is useful because tobacco use is a complex problem made up of many different factors. Examples of the kinds of factors relevant to smoking are shown in Figure 1. The systems approach reminds us that a complex problem is like a jigsaw puzzle – if you don’t have all the parts you can’t see the whole picture. 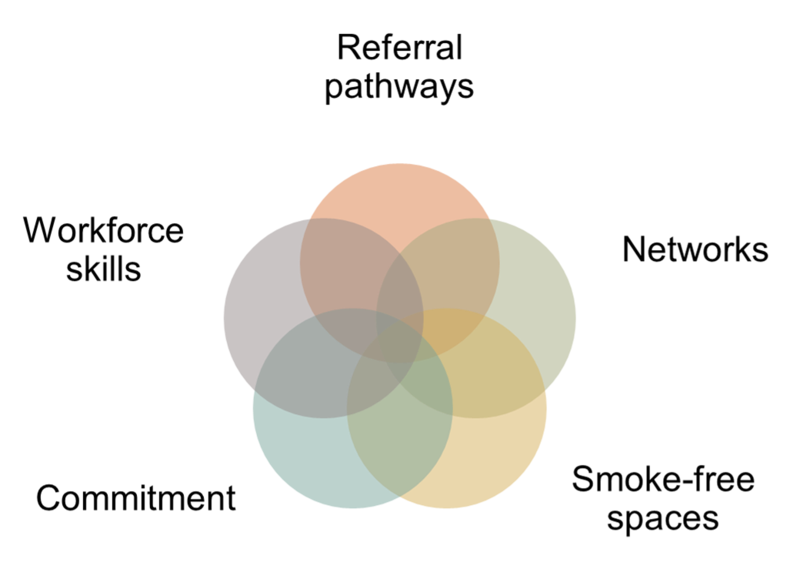 It is a reminder that everything works together – for example the different TIS activities, relationships between community organisations and individuals in the community – so you need to consider all parts of the problem in order to effect change. What is happening in your region to prevent smoking rates falling? What can be changed to support quitting? What can be done to encourage the local community, the workplace or the family, to help individuals to quit? Is there anything in the wider community or region that you can link into? A systems approach also provides a useful way of thinking about health care services. The TIS program can be seen as part of a larger preventive health care system, all connected in different ways such as through referral pathways, and client appointments (see Figure 2). One of the important challenges for TIS is to map out the system and make connections between the different parts e.g. connecting the Aboriginal and Torres Strait Islander Health Worker with the smoking cessation nurse/counsellor. 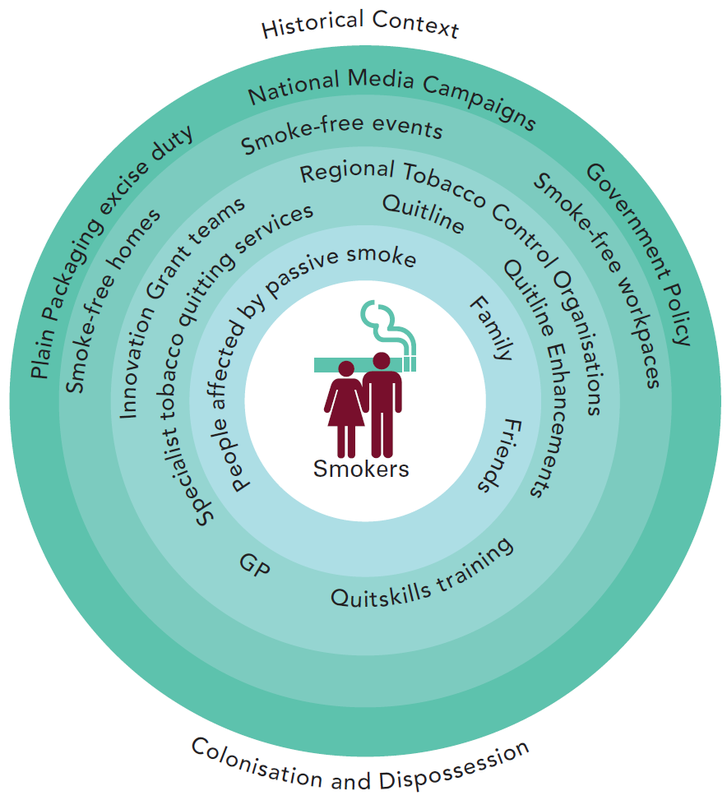 An example of how the systems approach has been used to develop a Tobacco Control Project for Aboriginal Australians can be found here on the Australian Prevention Partnership Centre website. One really good way to start working out your systems, and identifying resources, is asset mapping. This approach is very flexible and can easily be adapted to particular community needs. One of its main advantages is that it takes a strengths based approach to mapping systems. By identifying the strengths and resources of your community (assets) in relation to TIS, you can help to uncover solutions. Once community strengths and resources are recognised and mapped out, you can think more clearly about how to build on these assets to address community needs in relation to TIS. involve the community so as to construct a collective vision and plan. create a physical map using butchers paper, pens and post-it notes. other social services (e.g housing). You may have existing partnerships that you can build on to make the program a success, or you may have to start afresh. Relationship frame – build a safe, non-threatening environment in which people feel they can share their thoughts, feelings and values honestly with others. The relationship frame provides a good environment in which to solve problems, support each other and achieve program outcomes. Performance Frame – monitor the effectiveness of outcomes. You can find out more about performance monitoring in the Monitoring and evaluation section. Alignment Frame – look at the relationship between organisations and their members, and identify any blockages that are stopping them from achieving the goals set in the performance frame. Finally, it is essential to make sure you have the capability and capacity to undertake your planned program. Box 5: What are workforce capacity and capability? Workforce capacity means how much the workforce can do. Capacity is determined partly by how many staff or volunteers are working for you, and their availability to perform particular tasks (e.g. TIS activities). However it is not just about ‘bodies on the ground’ – capacity is also determined by staff and stakeholder performance, engagement, motivation and effort. Workforce capability means what the workforce can do, the skills and knowledge workers have, including things such as the ability to be innovative. providing access to appropriate training and support for staff, both formal and informal. More information about relevant courses, conferences and workshops can be found under Events and Training, or by contacting NBPU TIS. forming partnerships and engaging with stakeholders. Having commitment from leaders within the community and your organisation to reduce the level of smoking in your organisation and the region will encourage more smoke free spaces and smoke free events. This report provides an evaluation of the Indigenous Chronic Disease Package (ICDP), a federal government initiative designed to improve the capacity of primary health care services to more effectively prevent and manage chronic disease among Indigenous populations. This article reports the extent to which an ecological approach was integrated into an Aboriginal community-based cardiovascular disease (CVD) and type 2 diabetes prevention program, across three-intervention years. This article explains how socioecological concepts are relevant to programs that use multi-level interventions and policy changes to tackle tobacco control.